What opera company isn’t hoping for one right now? A good tenor is a gift any day of the year. In the tradition of revisiting Christmas favorites as the holiday approaches, here is one from the early period we emphasize in this Teatro Nuovo series: Evan Williams, born in 1867 in Mineral Ridge, Ohio. Williams came from a background that scarcely exists today, and built a type of singing career that doesn’t exist at all. His parents were Welsh immigrants and he went to work at the age of 14 in the coal mines near Akron. His voice was discovered in a choir and he soon joined an “octet club” (is there such a club in existence today?). At 17 he won a tenor solo prize at a choral festival, but he started a family not long after, and so did not dare give up mining until 1889, when he ventured to Cleveland for voice lessons. He worked as an elevator attendant for approximately seven dollars a week, depending on a janitor to cover for him while he stole out once a day to study singing. But the lessons went well; his teacher’s connections got him church jobs, and from those he advanced to similar ones in New York City. (Church gigs in those days were significant enough that the New York Times regularly reported new hires and the moves of singers from one congregation to another.) These led to oratorio engagements, eventually reaching Carnegie Hall, and these in turn to similar work in London. Williams continued on the concert and oratorio circuit right up to his sudden death during a 1918 tour. Along the way he had collaborated with Dvorak, Sir Arthur Sullivan, Ernestine Schumann-Heink, Victor Herbert, and the young Leopold Stokowski. He never sang in opera. If we heard of a tenor today whose career was exclusively in recital and oratorio, we would imagine a thread of voice and high emphasis on artistic nuance, but Williams recorded arias from Lohengrin, Die Meistersinger, Carmen, La bohème, L’africaine, La favorite, L’elisir d’amore, Martha and Gounod’s Reine de Saba, and sounds as though he would have been close to ideal in all of them. Apart from a few Latin oratorios, he also never sang in any language but English. 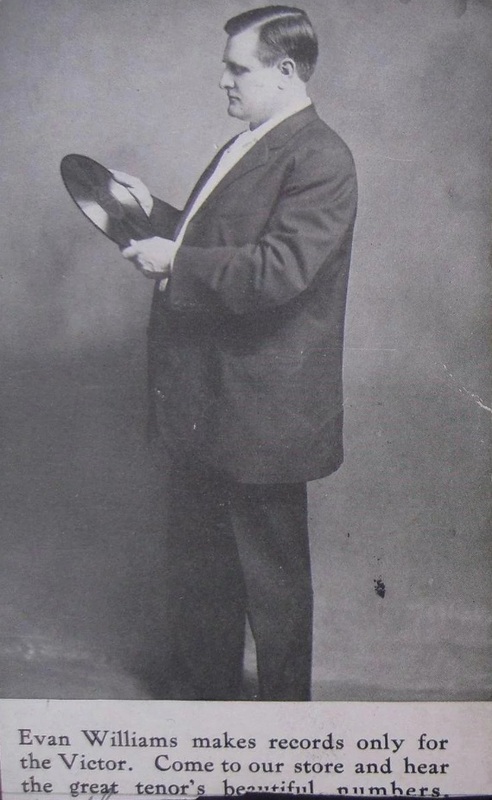 He made nearly 200 records, holding his own in Victor’s pricey Red Seal list where the main tenor competition was Caruso and John McCormack. There is some great tenorizing to be heard in this long series: oratorio arias of Handel, Haydn, and Mendelssohn; songs by Schubert and Dvorak; the operatic solos already mentioned; parlor songs by the dozen - and this week’s record, the “Cantique de Noël” of Adolphe Adam, from 1908. The orchestral arrangement is a little questionable (did we really need those meandering string obbligato lines? ), but the singing is straight-up fantastic. Every vowel clear, every tone effortlessly even, genuine operatic excitement as he lifts into the top, un-showy but unmistakable fervor in delivery. He sings the song in E major (I mention this because the usual tenor key is E-flat, but by comparing the vibrato with the operatic records one can confirm that the record is playing at the right speed here). The climax is a radiant top B, followed by a slow walk down the scale to E that is a voice lesson all by itself. His records are a gift that keeps on giving; to any aspiring tenors interested in searching them out, I especially recommend “Sound an Alarm,” “Songs my Mother Taught Me,” “Spirit so Fair” (better known as “Spirto gentil” or “Ange si pur”), and the Gounod and Wagner arias. But you could hardly go wrong with any. Teatro Nuovo puts great emphasis on learning from the singers who had never heard, or heard of, microphone singing - primitive recordings from more than a century ago, forming a link to the traditions of opera’s heyday and the infinite potential of the natural, unassisted human voice. Check this space regularly for samples, and click here for some pointers on how to listen.